1) Keeping Track Makes The Process Real: As you can tell from the chart below, our financial growth has been about $50,000 a year. While this is not a lot, it does indicate that saving and investing in real estate and stocks is an effective method of building wealth. This is important because it is quite one thing to read about money in a book and another to see it working in real life for you personally. Graphing makes the saving and investing processes real because you can see your wealth increase or decrease. 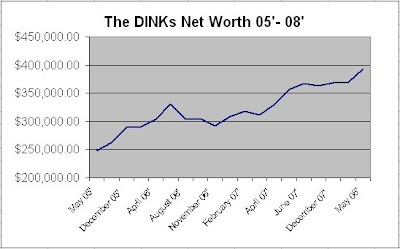 2) Keeping Track Helps To Determine What Works: You cannot tell from the graph below, but the DINKs bottom line growth has been due partly to stocks and good debt management. For example at the end of 2007, the graph was flat lining so we started putting money into income stocks and maxing out Miel’s 401k. Interestingly enough, August of 06′ was the time we realized our adjustable rate mortgages were impacting us. By adding up the new worth figures we knew that Washington Mutual’s monthly $50-100 increase in ARM payments was eating our lunch. While these may seem like common sense, the processes of doing the net worth calculations greatly illustrated what was helping or hindering the wealth building processes.